Hi everyone! Have you ever sat down on grass that you thought was dry only to feel water seeping through your pants after you've sat there for a minute? No fun! Well today I'm sharing a little blanket you can make to sit on so that will never happen again! With 4 kids in soccer we do a bit of sideline game watching. We don't have soccer chairs for everyone in the family so we bring a blanket for the kids to sit on. It is humid here in Florida and the ground is always a little damp. After ruining a couple quilts over the years because things take forever to dry here, I got smart and stitched up a waterproof version. Of course I could have just gone out and bought a Neat Sheet , but they are a wee bit pricey for me and I am always up for an easy project and a chance to play with my favorite fabrics. This blanket is sew easy to make! It is simply a vinyl tablecloth with fabric on the back, bound with bias tape. It's thin, which means it dries out quickly, perfect for our humid weather! There is no batting inside except the fuzzy backing of the tablecloth. No need to quilt it!. As you know, that fuzzy backing sticks to everything and clings onto the fabric very nicely. When you aren't using it as a blanket you can still use it as a tablecloth. Bonus! No dirt or leaves will be sticking to that fuzzy backing because the fabric is covering it. Brilliant! Have I convinced you that you need to make one of these yet? I'd like to share the tutorial with you, however, somehow all of my in process photos were erased except one. But I promised a tutorial and the show must go on, so here's my attempt at a tutorial diagram style. 2 yards of Quilting cotton fabric I used this fabric! Lay the vinyl tablecloth fuzzy side up (vinyl side down) on the floor. Lay the Fabric RIGHT side up on top of the vinyl tablecloth. Smooth the fabric over tablecloth to make sure everything is lined up nicely. Trim corners using the tablecloth curved corners as your guide. Sew the binding on: Slide the raw edge of the tablecloth sandwich into the fold of the bias tape. Leave about a 3 inches of binding un-sewn at the start. Stitch about 3/8th inch away from the fold. Overlap your binding by 1/2 inch and trim excess binding. Unfold the two binding ends all the way and sew them together using a 1/4 in seam allowance. Refold the bias tape and stitch the gap to finish it off. And there you have it! A lovely Waterproof Blanket ready to use! Want to see more tips and tutorials in my Soccer Mom Series. Here are the links! Wow! What an awesome post! 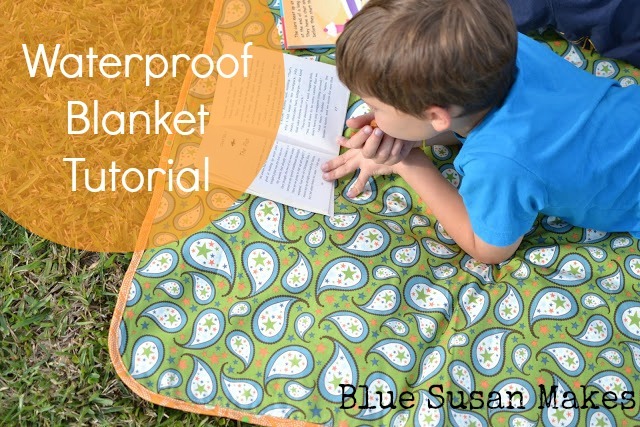 This waterproof blanket is indeed great! I bought one just last month for my daughter and it really works! Thanks for sharing this impressive article. This is a great tutorial! Just a question, how well does it wash? I imagine hand wash only? I'm not sure since I haven't washed mine yet. I imagine it would be fine as long as you hang it to dry. I think the only thing that might happen would be the coloring on the vinyl rubbing off a little. If you wash it, let me know how it turns out.